Looking for a vegan gift ideas? You can’t go wrong with giving them a gift card to their favorite restaurant. Or better yet, making your shared holiday meal 100% vegan! But if you want to dive a little deeper for some thoughtful vegan holiday gifts, read on. People who live a vegan lifestyle do it for a reason. Being vegan goes against the flow, and it isn’t always easy. But we do it because it’s a positive force for change in the world. Often, folks are vegan for the planet, for their health, for the animals, or for good karma. If you can identify one of the reasons why your friend/family/gift recipient is vegan, it might give you a hint on what gifts to give! For the vegan who loves the planet! 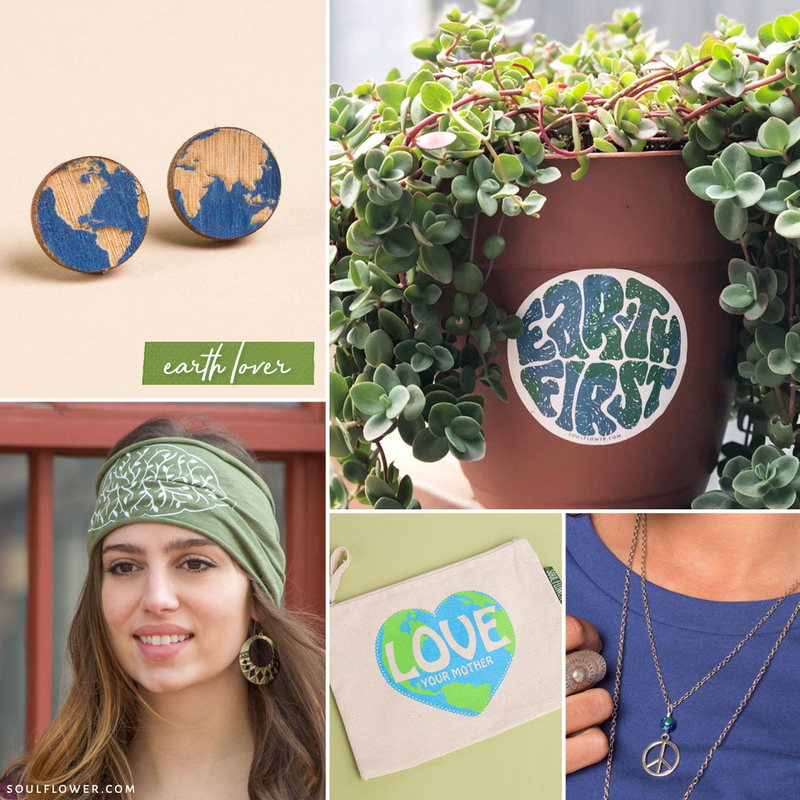 Try these sustainably-sourced Wood Earth Earrings, Earth First Sticker, Love Your Mother Zip Pouch, Love Your Mother Sticker, or the World Peace Necklace. For eco-friendly gifts that’ll help them go zero waste, try Life Without Plastic. Don’t forget the eco-friendly gift wrapping! 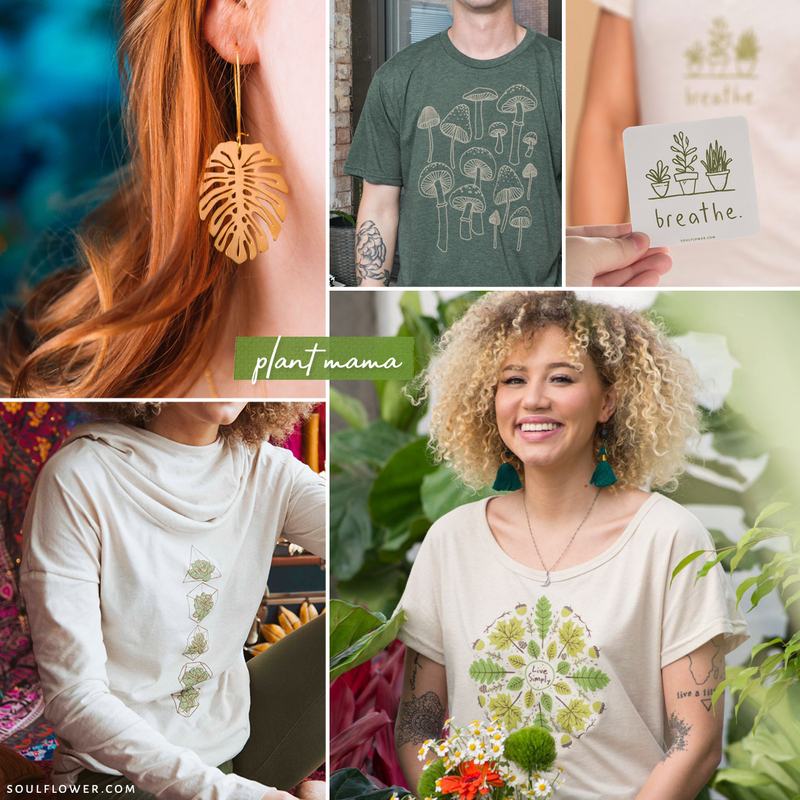 For the plant mamas, plant papas, and all-around nature lovers, get ’em a gift with green. Might we suggest Gold Leaf Earrings, Mushrooms Recycled T-Shirt, Breathe Sticker, Succulent Cowl Hoody, or this Live Simply Slouch Tee. If they’re less into growing their own and more about enjoying the outdoors, check out Gifts for Tree Lovers for more ideas! If your bud is into all things healthy, it’s likely they’re also into farmer’s markets and home-cooked meals. 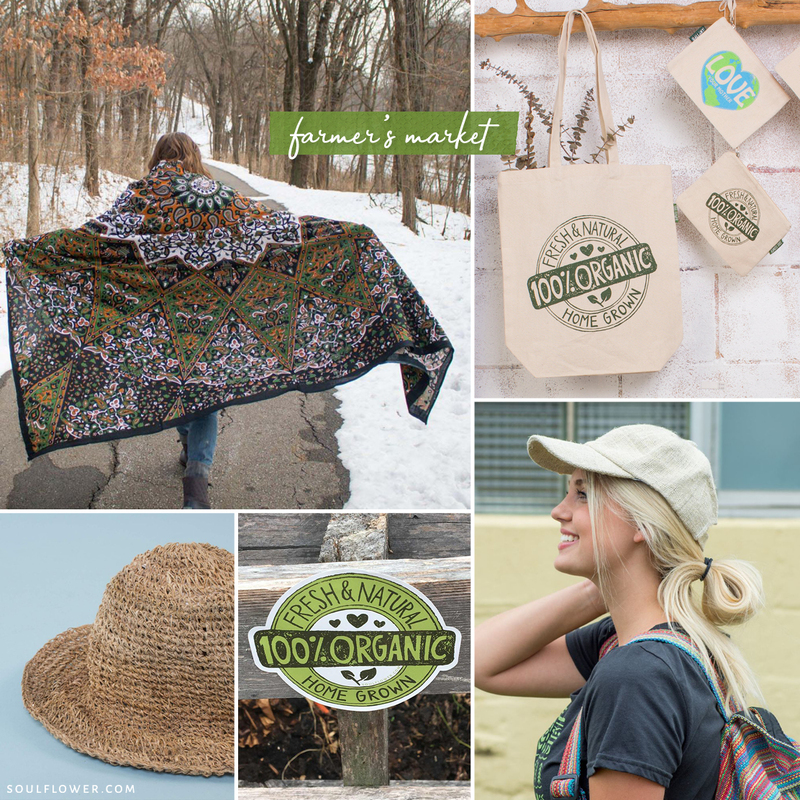 They can start by wearing a Hemp Baseball Cap or Hemp Sunhat to the farmer’s market, carry their goodies home in a cute tote bag, then grab their tapestry picnic blanket to enjoy some local noms at the park. Bonus: 100% Organic Badge Sticker. For a gift of food, try a vegan baking mix from Coconut Whisk or plant-based meats and cheeses from Herbivorous Butcher (both of these companies are located right here in Minnesota, just like Soul Flower is!). Another fun gift for vegan foodies is this Vegan Passport, a little guide that helps you order vegan food in any language while traveling! A vegan cookbook would make a nice gift for anyone who’s vegan, vegetarian, or veg-curious. We like How Not to Die, Vegan Stoner, and Thug Kitchen. At the heart of veganism is not eating or harming animals, which is why many vegans are animal lovers! 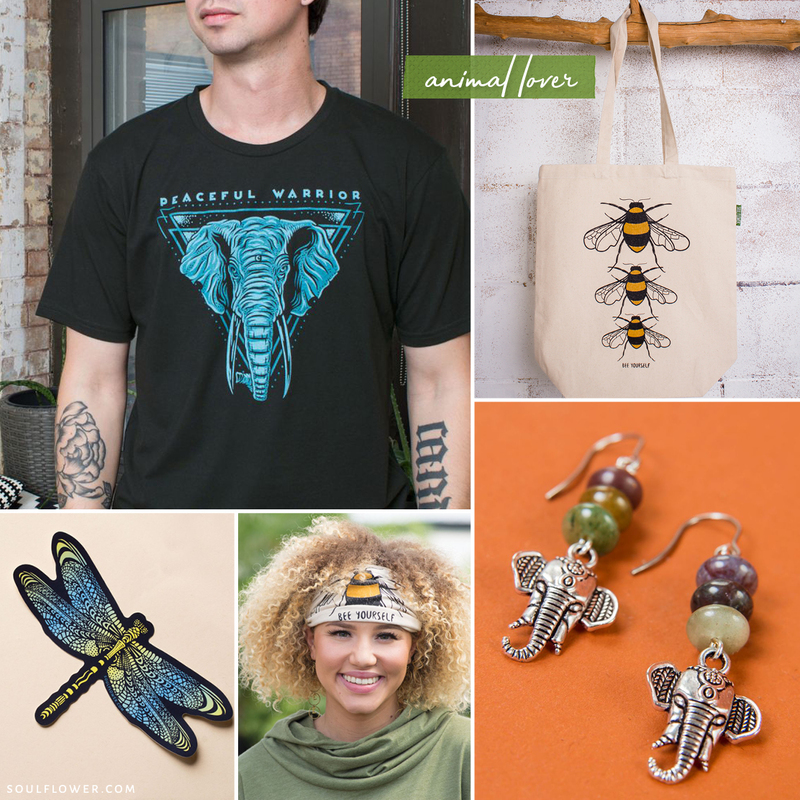 Ideas shown here: Peaceful Warrior Elephant Hemp Tee, Bee Yourself Organic Tote Bag, Dragonfly Sticker, Bee Yourself Headband, Chakra Jewelry, and Jasper Elephant Earrings. Here are even more Gift Ideas for Elephant Lovers. Many cozy winter items are made with wool, cashmere, alpaca, and other animal fibers. Vegans usually don’t want those items, even if they claim to be ethically harvested, because they don’t use animals as products, period. But vegan warm threads do exist! Just look for organic cotton, polyester, and acrylic instead. 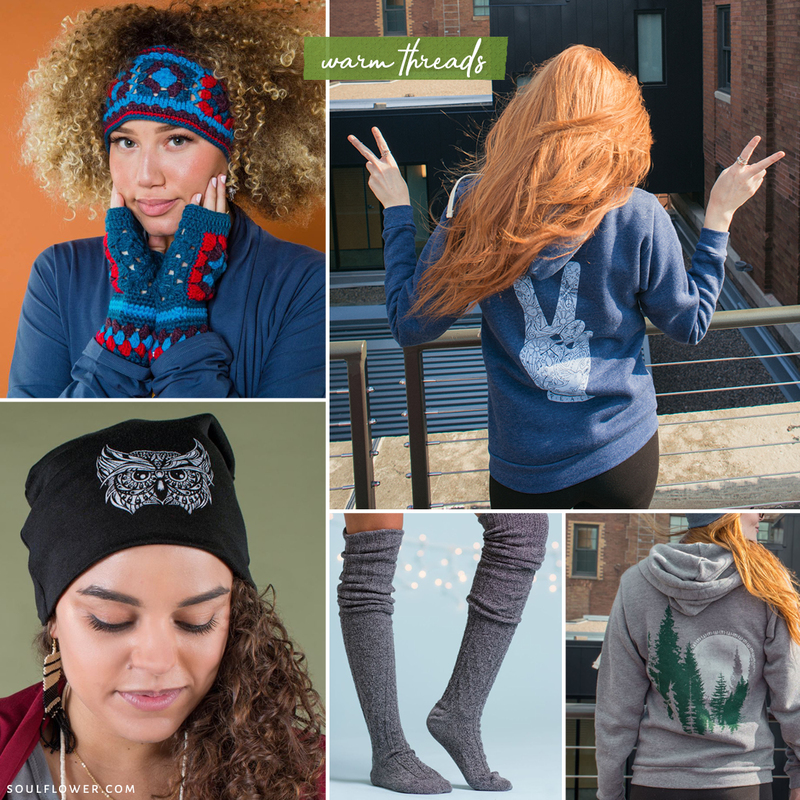 Shown here: Granny Square Headband and Fingerless Gloves, Peace Fingers Hoody, Owl Beanie, Slouch Socks, and Full Moon Hoody. Some vegans live the lifestyle because it means good vibes all around, for everyone! You might know (or be!) one of those kind-hearted, free-spirited vegan hippie dippies out there. We love you! 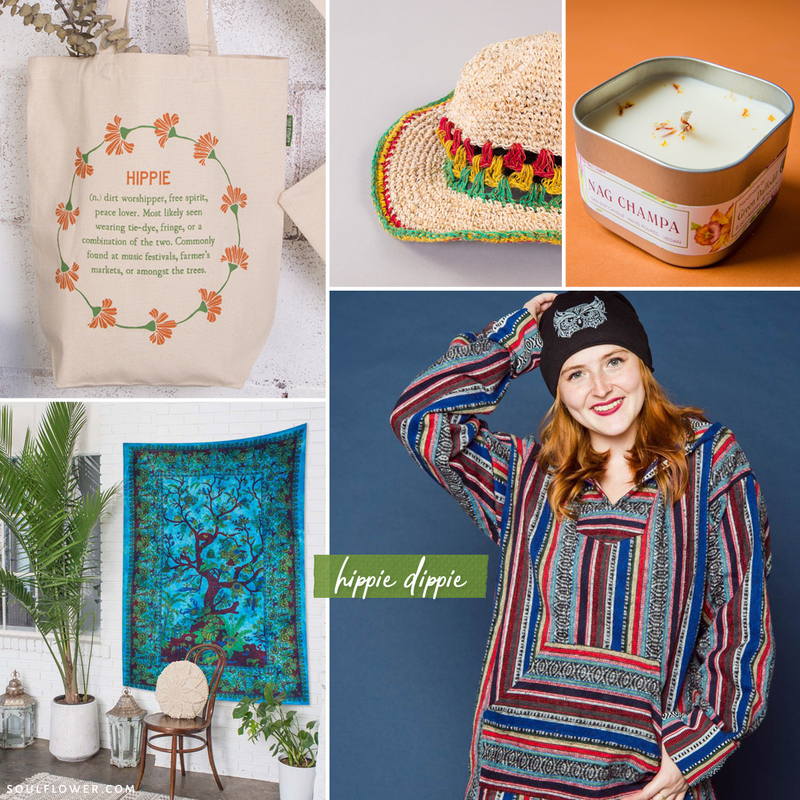 Gift ideas shown here: Hippie Definition Tote Bag, Rasta Hemp Hat, Nag Champa Vegan Candle, Tree of LIfe Tapestry, and this all-cotton vegan Baja Hoody. 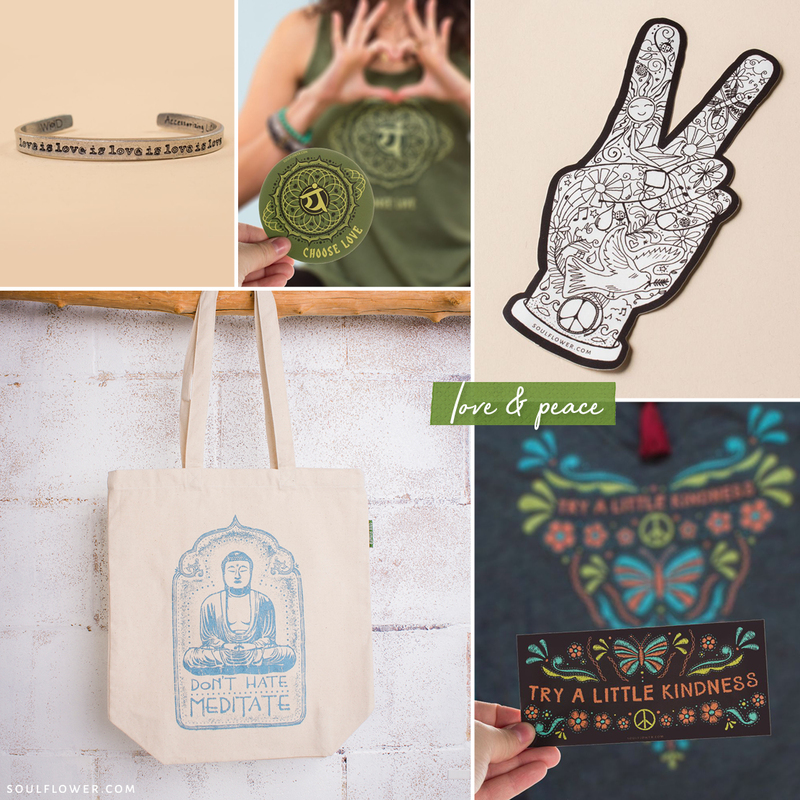 Spread some positive messages of peace and love with these simple and super affordable gift ideas: Love is Love is Love Bracelet, Choose Love Heart Chakra Sticker, Don’t Hate Meditate Tote Bag (and our other boho bags), Try a Little Kindness, or this classic Soul Flower Peace Fingers Sticker. Bonus gift guide: Gifts for Free Spirits.